I long ago gave up the idea that American leadership is simply stupid. Corrupt, or betrayed from within, but not stupid. -W.E. Despite the fact that China is engaging in a deliberate military expansion, and the fact that tensions are rising between it and Japan, our ally, over disputed territory and the fact our nation has endured numerous cyber attacks from China, the Pentagon has apparently decided to waive laws banning Chinese-built components on US weapons in order to continue purchasing $2 magnets used in the production of F-35 aircraft. You might recall back during the Hurricane Katrina disaster, US Army Lieutenant General Russ Honore was called in to take charge of the situation. His initial assessment was summed up in the statement, “City Hall is stuck on stupid” — a commonly used expression in the military. I assure you General Honore would say the same about his development. Chief U.S. arms buyer Frank Kendall allowed two F-35 suppliers, Northrop Grumman Corp and Honeywell International Inc, to use Chinese magnets for the new warplane’s radar system, landing gears and other hardware. The waivers apply to inexpensive parts, including $2 magnets, installed on 115 F-35 test, training and production aircraft, the last of which are due to be delivered in May 2014. The F-35, being developed by Lockheed-Martin, is the Pentagon’s costliest arms program and is already years behind schedule and 70 percent over the original budget estimate. This is a perfect example of why we need to have audits of defense spending, something I supported when I sat on the House Armed Services Committee. We cannot have the defense industry driving the train and must first look at instituting SLEP (service life extension programs) for weapons systems. As well, why would we go to China for these cheap parts in the first place? Here in South Florida we have had a horrific experience with cheap Chinese drywall, and we have had issues with other Chinese products, so why on our most advanced fighter? Besides, several US manufacturers make similar magnets. And why now? As we reported, tensions in the Pacific rim are mounting due to China’s usurpation of the Senkaku Islands and its air defense zone claim over these Japanese territories forcing air transit clearance. As well, we are witnessing China engage in a deliberate military expansion, centered around its maritime capability – witness its recently conducted naval maneuver which threatened the right of passage of a US Navy warship. The Pentagon itself has endured countless cyber attacks emanating from China – in fact I recall one such attack while I was stationed in Kandahar. Could it be we’re being held ransom? As former Chairman of the Joint Chiefs of Staff Admiral Mullen once stated, “our national debt is our greatest threat to our country.” Since China holds some 27 percent of our federal debt, are they using that as leverage against the United States? 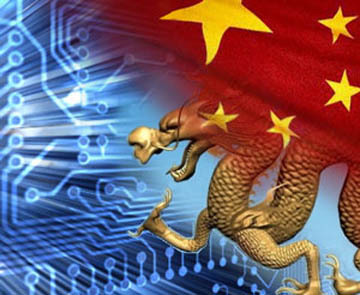 China cyber-attacks the Pentagon and threatens our warships — and we’re buying $2 parts for F-35s from them?